This has been an odd week in aviation news. Here’s some of the background on the headlines. The First Officer landed the plane, not the passenger. Still, she must have been thrilled that there was a qualified pilot on board to help her with the checklists and the radio. Gongol, his wife and daughter were on the way from Des Moines International Airport Dec. 30, with 151 other passengers and six crewmembers, after spending the holidays with his family. To him and his family, the day was just like any other, except for a short flight delay due to weather. Approximately 30 minutes into the flight, Gongol, a B-1B Lancer pilot, noticed the engines power down to idle. The thoughts immediately started jumping through his head; there were a variety of reasons why the engines would shut down to idle, none of them categorized as normal. Slowly, the aircraft began to descend and turn right. At that moment, Gongol thought it was a medical emergency with a first class passenger, his instincts told him to stay seated and stay out of the way. A fourth call went out, “are there any non-revenue pilots on board, please ring your call button.” Immediately, Gongol realized the pilot was the patient. He looked to his wife; as she gave him a nod, Gongol pressed his button and headed toward the flight deck. Apparently the most stressful issue was taxi-ing: It was her first time at Omaha airport and she had never taxied a 737 before. This was published by German tabloid Bild with a video clip of a low approach over the beach coming into Helgoland, a popular German tourist resort. To be fair, the original piece does not mention sunbathing. Breathtaking video – Plane at Helgoland almost lands on Holiday Maker! The Piper Archer (lovely plane!) is shown on final approach coming in way too low. The man in the video wasn’t sunbathing, he was walking along the beach. He flung himself onto the sand when he saw it flying at him. You can see that he makes himself as flat as possible before the aircraft flies over him and takes out the fence. In my defence I can say that I didn’t see him because he was lying down and I’m just very grateful it worked out well and I didn’t land on him. I don’t want to say any more than that. I fear I will be in for a fine from the Federal Aviation Office but I hope I will be able to keep my licence. Who Forgot to Set the Parking Brake? 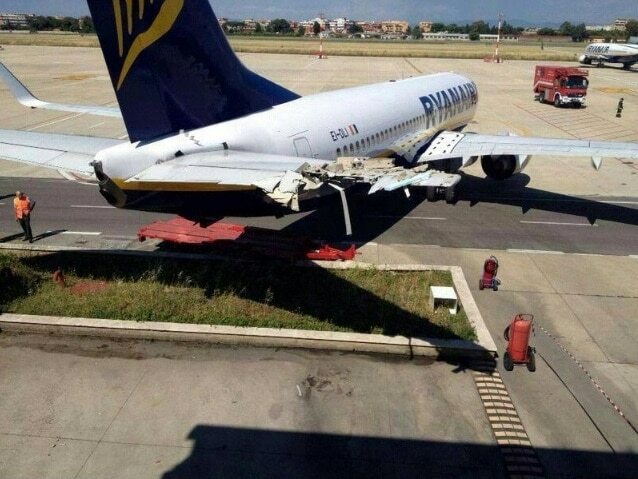 A Ryanair Boeing 737 rolled into the garage of the fire station at Rome-Ciampino Airport on Thursday. Ryanair B737 damaged is registration EI-DLI The details are still unclear but according to Italian news the aircraft rolled into an adjacent building causing significant damage to the horizontal stabiliser. It is understood that there was no one onboard at the time and no injuries have been reported. Yesterday all ground handling staff at CIA airport were on strike and all flights into and out of CIA airport were cancelled therefore it is unlikely any Pilots were on or near the aircraft. Ryanair had cancelled forty flights as a result of the unexpected strike by staff at their ground handling agent at Rome-Ciampino and Rome-Fiumicino, Groundcare, offering a refund or a rebooking to their customers. Someone at the airport anonymously described the event for the Daily Mail. It was surreal to watch. This big heavy jet just started to roll backwards gathering speed until it crashed into the garage of the airport fire station. The whole thing only lasted a matter of seconds but the noise as it smashed into the building was terrific. It was grinding metal and the damage was quite severe. The guttering on the building was ripped off and wires and bits of metal were hanging off the plane. The Daily Mail goes on to state that a criminal investigation is underway at Rome-Ciampino airport to discover what happened. According to a poster on the Professional Pilots Rumour Network, the chocks were not in place. No comment was made as to the state of the parking brake. It seems likely that some heads are going to roll. So, that’s this week’s headlines! First officers in any serious airline nowadays are fully trained up and qualified to take-off, land and taxi the aircraft. So it seems strange that the 1st officer in the first news bite allowed the engines to spool down and the aircraft to commence a descent and a roll. The reason why is not mentioned. Perhaps the first officer had already declared an emergency and begun a controlled descending turn to the nearest suitable airport ? News bite no. 2: Stupidity. No further comment. No. 3: One must assume that the last flight crew had completed the shut-down and parking check list. It is not unusual for the parking brake to be released when an aircraft is parked for a prolonged period of time. Depending of the type of aircraft, hydraulic pressure (or, in the case of e.g. the F27 pneumatic pressure) may drop anyway. The main cause of this incident would appear to be failure to ensure that the wheel chocks were in place. Usually, this is done by the ground crew but the flight crew are supposed to ensure that this is done. So who will face the wrath of Michael O’Leary remains to be seen. Even if only minor damage is visible, the resulting cost often runs in the tens of thousands of $$$$$$$$$ ! Quite a few years ago, a ground vehicle, a mobile generator, driving probably a bit too fast at Dublin Airport, impacted with the wingtip of a parked Ryanair BAC 1-11 500. The force of the impact was such that the nosewheel of the aircraft was displaced sideways (!) by more than a metre. Nevertheless, the structural integrity of the wing was not affected. There was quite some bent metal but the aircraft survived to fly again a few months later. The truck was a write-off. As our instructor used to say: the One-Eleven was built like a “brick sh..house”!